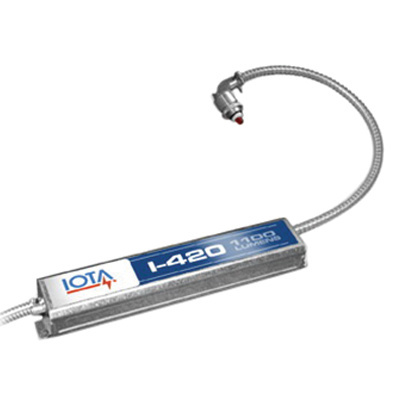 Iota Fluorescent emergency ballast has durable galvanized steel construction and cold/rapid start type. It is voltage rated at 120/277-Volts AC, power rated at 3.5-Watts, temperature rated at 0 to 50 deg C and frequency rated at 60-Hz. This ballast supports two fluorescent lamps that provide wide range of lumen output. It is suitable for use with LED retrofit tube lamps, switched or unswitched fixtures. It comes with high temperature recyclable NiCd battery and 1-piece TBTS test switch/charge indicator accessory kit. It is perfect for use in damp locations and plenum fixtures. The fluorescent emergency ballast meets UL, cULus, NEC, IBC and RoHS standards. * Inventory displayed is accurate as of 04/25/2019 08:40 EDT.